You've probably seen a few pictures of one (or more) of Jupiter's moons crossing the surface of the giant planet. Maybe you've even seen a transit through your telescope. 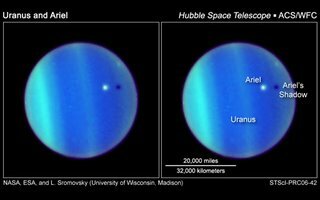 Well the Hubble team have managed to do the same for Uranus. This picture shows Uranus' moon Ariel crossing the face of the planet preceded by the moons shadow. This would be an eclipse as seen from the 'surface' of the planet. Now there's something you won't see very often!